John 1:35-42 35 The next day again John was standing with two of his disciples, 36 and he looked at Jesus as he walked by and said, “Behold, the Lamb of God!” 37 The two disciples heard him say this, and they followed Jesus. 38 Jesus turned and saw them following and said to them, “What are you seeking?” And they said to him, “Rabbi” (which means Teacher), “where are you staying?” 39 He said to them, “Come and you will see.” So they came and saw where he was staying, and they stayed with him that day, for it was about the tenth hour. [a] 40 One of the two who heard John speak and followed Jesus[b] was Andrew, Simon Peter’s brother. 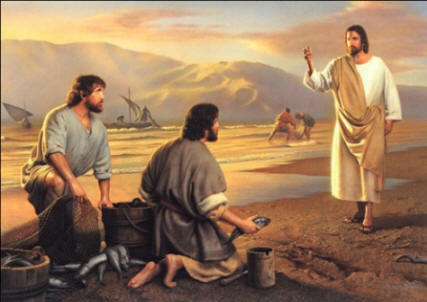 41 He first found his own brother Simon and said to him, “We have found the Messiah” (which means Christ). 42 He brought him to Jesus. Jesus looked at him and said, “You are Simon the son of John. You shall be called Cephas” (which means Peter[c]).